In May I bulleted 13 undeniable bullish facts about nuclear power and uranium prices, followed by updates on my uranium focus stocks. Most market players still ignore the sector or at best continue to hold off while trying to time its absolute bottom. We play around even though we know it's a mug's game that often results in a woulda, coulda, shoulda moment as we buy-in later at higher prices. I continue to believe that quality uranium mining stocks represent the best no-brainer near- and long-term contrarian value play with the most upside of any market anywhere. While it is clear that the shutdown of all of Japan's reactors after the Fukushima nuclear accident, soon followed by Germany, caused uranium to go into its tailspin downtrend since 2011, it is also clear that more reactors are in the works worldwide today than even before then. Demand is growing, current uranium needs already outstrip supplies mined each year, secondary supplies are drying up, and exploration and development of new supplies will remain uneconomic for most miners until prices again exceed $80 per pound. Even nuclear power utilities may get caught in a buying scramble. Utilities usually have long-term uranium supply contracts, but with low spot prices millions of pounds representing around 15-20% of the world's needs after this year forward remain uncovered. Most analysts agree that fundamental shortages in the spot market could start soon that may turn into major deficits by 2020. Nobody is factoring in investor mania panic buying like we saw a decade ago when U3O8 hit $137 per pound. In any event uranium spot prices likely bottomed last summer at $28 per pound; regardless most are still waiting for the media event of Japan's first reactor restart as uranium's buy signal. News from Japan about the two pending Sendai restarts suggest all legal hurdles have been cleared. Most now expect the actual first restart to occur between August and September. A July restart at this point seems less likely but could still be a big short-term catalyst if it somehow happens. Two of my uranium focus stocks mentioned last month are (AMEX:UUUU)(TSX:EFR) Energy Fuels and (AMEX:URZ)(TSX:URZ) Uranerz Energy. 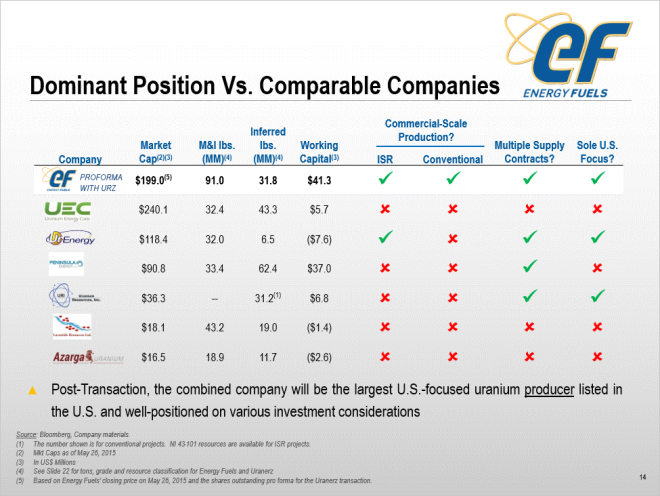 Both companies have producing uranium mines with long-term premium utility sales contracts and both have vast exploration and development projects all located across the Western US. Both are also in the middle of merging together to become the largest integrated uranium producer focused on the United States. As the table below demonstrates, the combined company should have several competitive advantages such as access to easier funding from having a larger market cap, larger uranium resources, more working capital and the only conventional uranium mill currently operating in the U.S., to being able to employ both low cost in-situ recovery or conventional underground mining methods as needed. Last month I gave my take on some of the important parts from the merger's 394 page F-4 registration statement. I continue to dig for clues when this merger will happen as share prices may jump as the closing gets closer, as institutions feel more comfortable that it will happen without any big hiccups. Cozy signs that the pieces are coming together include the June 10 news release: Largest Independent Advisory Firm ISS Supports the Proposed Merger/Acquisition Between Energy Fuels and Uranerz Energy. Institutional Shareholder Services (ISS) recommends that all shareholders vote for the deal. You can listen to Energy Fuels' CEO Steve Anthony discussing the merger when presenting at Cantor Fitzgerald's 2nd Annual Global Uranium Conference on June 4, and view his PDF presentation. Energy Fuels' annual and special meeting is this Thursday. The company's May 21 news release later states, "Uranerz is also expected to schedule its shareholder meeting to consider the Transaction for June 18, 2015, assuming the US Securities and Exchange Commission declares the Registration Statement on Form F-4 related to the Transaction effective next week. Assuming the Registration Statement is declared effective next week, requisite shareholder approvals are obtained at the respective shareholder meetings, and all other conditions to closing are satisfied or waived, this would allow for a closing of the Transaction to occur as early as June 19, 2015." As mentioned last month I have been expecting a July closing. From the F-4 I could not find a precise closing date or even a proposed date range, but I did find some drop-dead dates which indicate the deal must close by July 31. I expect others read it that way too. After more research and chewing on potential scenarios, I think there may be additional important short-term catalysts that I missed. Maybe this deal can close sooner, early in July or even before the end of this month. And I can see some very good reasons for both companies to try. I reread an article I posted on May 24, 2011 titled: Will Uranerz Be Inducted To The Russell 2000 Index Next Month? Annual reconstitution of Russell's indexes cause a flurry of speculation each June as institutions and traders try and figure out who will be added and who will be dropped. It's actually fairly easy math as these indexes are totally determined by market capitalization ranking on the last Friday of May, with the biggest companies in and the rest left behind. Index changes cause share volumes in those companies to skyrocket as index funds must adjust their portfolios immediately. Stock prices usually go up for those added and down for those dropped. The price effect can be dramatic, especially for low priced small cap stocks with fewer shares outstanding. Both Uranerz Energy and Energy Fuels have been added and dropped from various Russell indexes. My article looked at Uranerz in 2009 as it gained +49%, then as it was dropped in 2010 and fell -42%, and then calculated that it might be added again in 2011—which it was, and then dropped again in 2013. For each of those years the last Friday in June was the highest volume day of the year for URZ, which saw its trading go from the usual couple hundred thousand shares to 4-5+ million shares. The estimated market cap cut-off this year is around $177 million. The combined company could easily qualify, with around $21 million to spare, based on today's market caps of $90 million for Energy Fuels and $108 million for Uranerz Energy. But I had not expected this to happen until next June, after this July's merger. However, I just discovered that when a merger is in progress Russell may consider the combined market caps if the deal closes by June 19. Go back to Energy Fuels' May 21 news release where it talks about the June 18 shareholder meetings and approvals, the SEC declaring the F-4 effective, and other closing conditions. After the vote the biggie is SEC approval, which I doubt anyone expected before July. Instead of taking months, my understanding is that the SEC has already approved the F-4. Also remember that uranium stocks were very heavily shorted after Fukushima. I assumed they had covered by now but to my surprise as of May 29 there are still 5.55 million Uranerz Energy shares short and 93.4 thousand Energy Fuels shares short. Based on average daily share volume with nobody else buying it would take a week to cover UUUU and two months (43 market days) to cover URZ. What happens as traders realize the merger may close early and qualify to be added to a few Russell indexes? If prices start rising and then volume skyrockets from institutional and mandatory index fund buying at around the end of this month, doesn't this spell a potential major short squeeze? Still doubt uranium is a value play? Read this June 11 Reuters report about Warren Buffett partially funding a nuclear fuel bank in Kazakhstan. The second paragraph caught my eye which reads, "The scheme is designed to secure the supply of uranium for nuclear power plants should the commercial market be disrupted." News like this, especially with Buffett, tends to grab the attention of the media and retail investors, and adds credibility to nuclear power and uranium as a front page story again.